Order your own copy of Rise of the Separatists at your local retailer or online through our website today! The story of the Clone Wars is at once an epic tale of grand battles and sweeping political gamesmanship, as well as a deeply personal saga, featuring stories of courage and loyalty, temptation and redemption. Will the player characters pursue their duty at any cost, or will they question their orders and seek their own destiny? 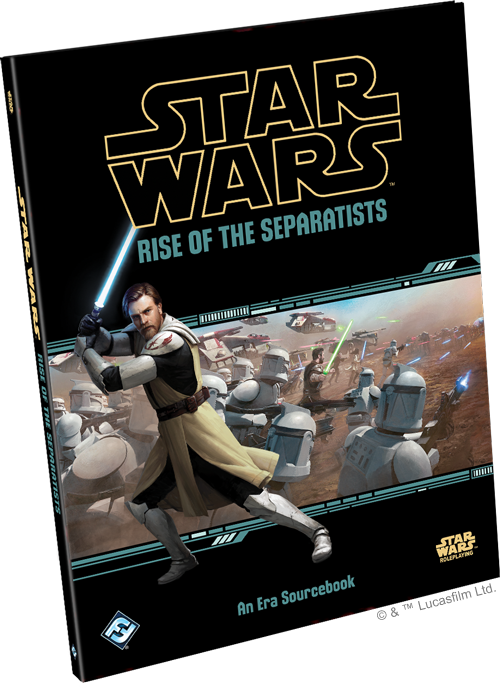 Rise of the Separatists—coming very soon to a game store near you—aids players and Game Masters alike in exploring the tones and themes of this period of galactic strife, with new mechanics and narrative frameworks to bring to your Star Wars Roleplaying campaigns. The fates of entire factions rest in the hands of the individuals who care deeply for their cause, but the challenges of war—and the costs required for victory—can sometimes cause those same people to break with their former allies and masters. To dramatize these conflicts and set up situations to force the player characters to face the same choices, GMs need to understand the motivations of the different factions, as well as the behind-the-scenes machinations of each faction’s most powerful actors. Rise of the Separatists looks in-depth at the origins and organization of the biggest players in the Clone Wars, from the Republic and the Confederacy of Independent Systems to the Jedi Order and the secretive Sith. Game Masters will benefit from a deep dive into the political structures of the Republic, from the past and present factions of the Senate, to the committees and bureaucracies that oversee Republic policy. A cast of political aides and NPC profiles for prominent figures like Padmé Amidala allows GMs to craft their own intrigues and double-crosses involving threats of corruption, sedition, militarism, or secession. Seen by some as a new, authoritarian extension of Republic authority, the Jedi Order plays a key part in the current state of galactic politics. 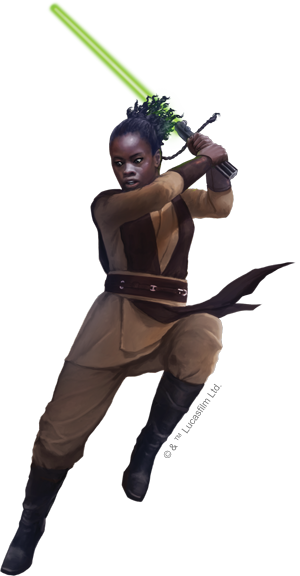 An overview of the hierarchy of the Jedi High Council and the other councils of the order offers plot hooks and moral quandaries for player characters to explore. Many wonder whether the Jedi have lost their way, sacrificing introspection and balance with the Force for immediate results on the battlefield. For the Separatists, this once-proud tradition seems to have become a mere pawn of the corrupt and ineffectual Senate. And with the Jedi sustaining heavy losses in the escalating fight, padawans are swiftly promoted to knights, and forced to train even younger padawans before their own training is truly complete. This era sourcebook also pulls back the curtain on the inner workings of the Grand Army of the Republic. A huge bureaucracy is vital to oversee the deployment and supply of clone regiments, local garrisons, and starfighter patrols, as well as medics and mechanics. In addition to fleshing out the forces of the Republic, including stock NPC profiles for archetypal figures, this book also provides Game Masters with a wide array of battle droid minions and adversaries to build up the CIS armies in their games, as well as the figures who have worked behind the scenes to secure their planet’s independence and prosperity. From the cunning Count Dooku to villains like Asajj Ventress and General Grievous, GMs can challenge the PCs with true nemeses over the course of the entire campaign. Though the true origins of the Clone Wars are shrouded in secrecy, the citizens of the galaxy are all too familiar with the cost they have had to bear. 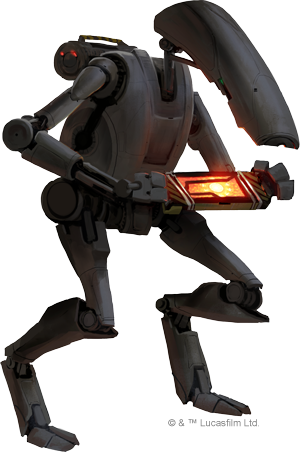 Profiles on the planets Geonosis, Kamino, Naboo, and Tatooine during this era provide additional context for the fighting as well as high stakes for the continually unfolding conflict. Each planet features modular encounters and planet-specific histories, points of interest, and recaps of famous battles fought there during the Clone Wars. 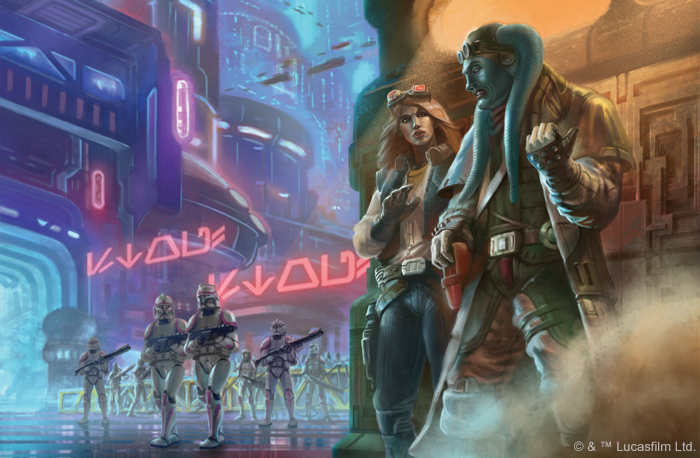 In addition to the wealth of information on the major players in the conflict and the worlds at stake, Rise of the Separatists includes guidance and new rules for recreating the feeling of The Clone Wars television series in your campaigns. Game Masters will find an entire chapter dedicated to rules for squads and squadrons, directions for structuring a session in the style of a film serial, and suggestions for expanding the cast of player characters through troupe-style play. 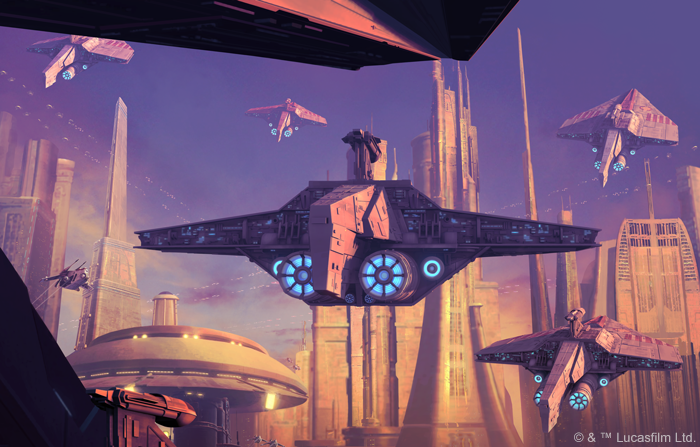 Jedi generals and ace pilots can call upon the rank-and-file to fight at their side in times of desperation, and the new rules for squads and squadrons let players lead these units into battle and command them into formation. Each formation gives a squad or squadron unique benefits, whether they are going dark to infiltrate an enemy position or putting together a search party to find lost allies or locate CIS scouts. Armed with these new optional rules, player characters can strike a decisive blow against an enemy or live to fight another battle thanks to the noble sacrifices of their comrades. In addition to these mechanical resources, Rise of the Separatists supports GMs in setting the stage for a truly epic confrontation, with suggestions for instances when zooming in or zooming out of the action can best capture the action and embroil the PCs in the conflict. With the variety of stories unfolding against the backdrop of war, the troupe style of play can assist groups in exploring all the stories and settings the Clone Wars has to offer. Rather than trying to contrive scenarios in which a group’s clone and Jedi characters always work together, players can create multiple characters to feature in different scenes and storylines at different times. Rise of the Separatists advises players and GMs on how to swap between these different troupes during a session, including guidance for balancing spotlight time and exploring a range of character motivations. Additionally, the tropes associated with film serials detailed in this book can help GMs maintain the frenetic pace of an action-adventure series, as well as keep your players coming back for more by ending on a cliffhanger. The Clone Wars were a time for friends and foes to demonstrate their skill and true allegiances, but the conflict will take a toll on them all. As the fighting escalates, those caught up in the conflict must decide for themselves whether they are still fighting for what they believed in, or if they too have had their cause twisted into something less-than-noble by powers behind the scenes. Rise of the Separatists gives GMs everything they need to explore the movers and shakers of this period, heighten the tension at the table, and structure their sessions to encapsulate the feel of the era and the television series. Players and GMs alike will soon have their chance to pick up this era sourcebook at your local game store or the FFG web store! Pre-order your copy today.